Scheduling in Cushion is very visual, providing a birds-eye-view of your projects and workloads. Cushion also displays your vacations and highlights when you’re available or overbooked. To schedule a project, create a new one and scroll to the Schedule section at the bottom of the form. Cushion uses estimated and actual dates, so you can learn from your projects, like whether they were delayed or dragged beyond the expected end date. When a project is delayed, Cushion will visualize the delay in the schedule graph, so you can easily see how it affects the rest of your schedule. Cushion also reveals insights about your client’s tendencies as you create additional projects. If a specific client always delays their projects, you can factor that into planning the next one—if you even want to continue working with them. To schedule a project in the future, specify the estimated start date and the project’s estimated duration. If the project has a hard deadline, you can specify an estimated finish date instead. Cushion will visualize this project as a transparent line in the schedule graph to indicate that it’s only an estimate. When the project actually starts or finishes, the line will become solid to show that it’s no longer an estimate. 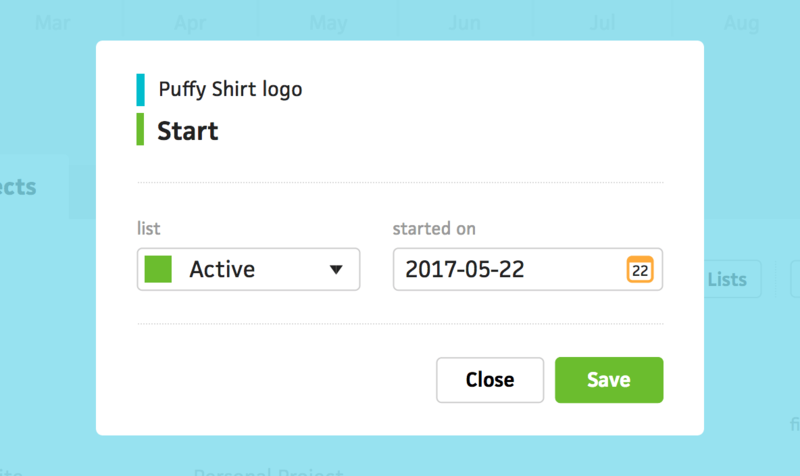 When you’re ready to start a project, use the project’s menu in schedule view to select the start option. Starting a project will open a window with today’s date as the start date. Cushion will also move the project to the list you have specified for active projects. By default, the Active list is auto-selected for projects that have started, but you can edit your lists’ behaviors if you use your lists in a different way. In the schedule graph, Cushion will add the start date as a solid dot and an arrow will appear to represent the current date—an easy indication that the project is active. When a project is finished, use the project’s menu again to select the finish option. Finishing a project will open a window with today’s date as the finish date. Cushion will also move the project to the list you have specified for completed projects. In the schedule graph, Cushion will add the finish date as a solid dot. At this point, you should take the time to celebrate. You deserve it. If the client took longer than expected and caused the project to drag past its estimated finish date, Cushion will visualize the drag in the schedule graph as a patterned line. If a client kills a project or you need to fire a client, you can cancel the project instead of deleting it and forgetting it ever existed. To cancel a project, use the project’s menu to select the cancel option. Canceling a project will open a window with today’s date as the cancel date. Cushion will also move the project to the list you have specified for canceled projects. In the schedule graph, Cushion will add the cancel date as an X. Hopefully you won’t see too many of these in your schedule.